I got a new Yashica today. Or maybe yesterday, I don’t know. I had a telegram from the home: ‘Yashica passed away. Funeral tomorrow. Yours sincerely.’ That doesn’t mean anything. It may have happened yesterday. The half frame Yashica Samurai x3.0 (with Samurai Integrated Technology!) is by far one of the most interesting items I’ve picked up to date. Created in 1987-88, it shoots two frames on the width of one 35mm frame. It allows for interesting in camera composition on varying subjects. At first glance what I like most about it is the ability to create a pair of images with a permanent record on film. It’s and upright SLR that looks like a palm held camcorder with a 35-105mm zoom lens. The lens is threaded for a standard 49mm filter with f-stops from f3.5 at wide angle to f4.3 at telephoto. This is according to info I found on the intarweb. I got it at Goodwill and it didn’t come with a manual, so I’ve been scraping details from random sources. It came with a Hoya star filter installed. I’m going to leave that intact for a while and see what happens. I added a 2CR5 battery and it was off and running. It works just like it came off the shelf so I’m feeling pretty lucky. I didn’t have so much luck with a Zeiss Ikon Contessa rangefinder I got a from Goodwill a while back which had an wicked sharp lens, but also a wicked light leak I can’t seem to fix. The best part is the “Samurai Integrated Technology” indicated on the case. It delivered immediate authority when the camera was busted out, as if fabulous secret powers were revealed to me and The Power of Greyskull was just invoked. 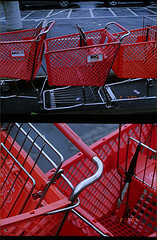 I put a roll of cheap Kodak Gold 200 I got at Kmart through it and some of the results from the first roll up on Flickr. good stuff. i’ve been wanting to get into lomos and other funky cams.